Kent Farrington! Again! Last week, USA’s Kent Farrington won the Rolex Grand Prix at the Royal Windsor Horse Show. 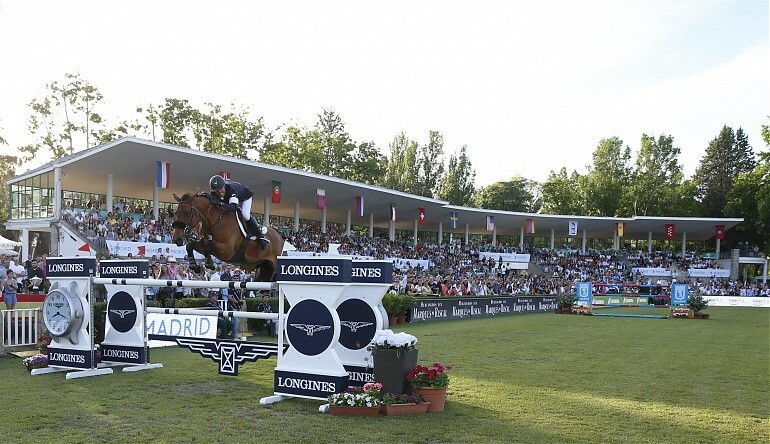 This week, Kent is the lucky winner of the 1.60m Longines Global Champions Tour CSI5* Grand Prix of Madrid. Is this the beginning of a winning streak? I don’t want to jinx him, but maybe. A thrilled Kent admitted that he “won by a whisker” on his small but mighty Belgian Warmblood mare Gazelle, as he took the victory by only 5 tenths of a second at 45.18 seconds. It takes a village, and Kent sure has one behind him. Taking the 2nd place prize by just a hair in the LGCT Grand Prix of Madrid was Germany’s Marcus Ehning aboard Pret a Tout. With a time of 45.68 seconds, Marcus didn’t quite go as full throttle as Kent but still put the pedal to the metal for a thrilling jump off. Fourth in this Grand Prix of Madrid, but still holding 1st in the overall rankings is a very happy Lorenzo de Luca (ITA). Lorenzo de Luca was the winner of the LGCT Grand Prix of Shanghai in April and fourth in Madrid was good enough to keep him at the top. Lorenzo also won the HDM Rewind’s “You Go, Glenn Coco” awards when he was 2nd to Kent in the Rolex Grand Prix at the Royal Windsor Horse Show. You’ll get him next time, Lorenzo. LGCT’s Next Stop: Hamburg, Germany.